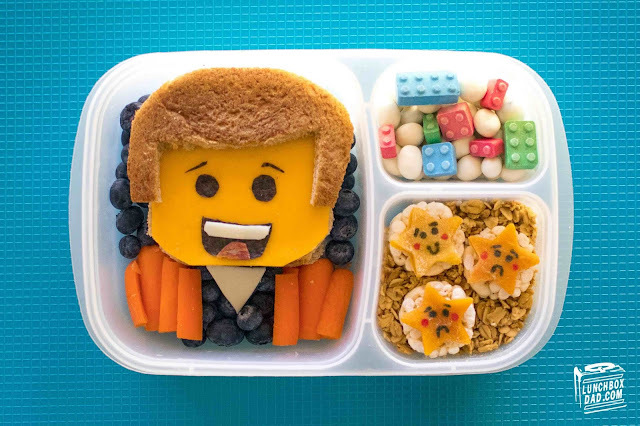 Ingredients: Whole wheat bread, cheddar cheese, salami, nori, white cheese, blueberries, carrots, yogurt covered raisins, LEGO shaped candy, granola, dried mango, red and black food coloring or food coloring markers. 1. Cut cheese and two slices of bread into a square and round off the corners to make the minifigure head shape. Build a sandwich with cheddar cheese on top to create Emmet's head. 2. 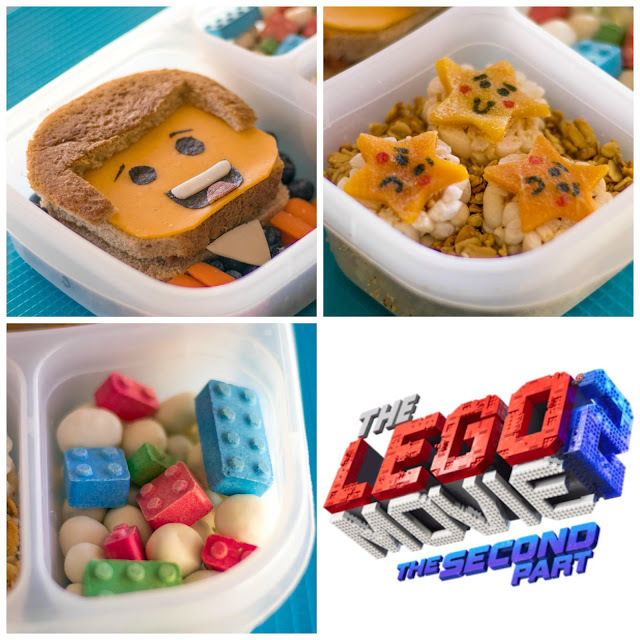 Use nori, white cheese, and salami to create Emmet's eyes and mouth. Finish by cutting the heel of a slice of bread into the shape of his hair. Place in main compartment. 3. Arrange carrots to make his vest and then drop in blueberries and top with a triangle of cheese as shown in photo. You can fill in the space around his head with blueberries if desired. 4. In side compartment put yogurt covered raisins and candy LEGO blocks. 5. Fill other side compartment with granola, or any other background that you have on hand. Cut dried mango into star shape to make the Star character that you see in the movie trailer. Draw the faces on using black and red food coloring marker.